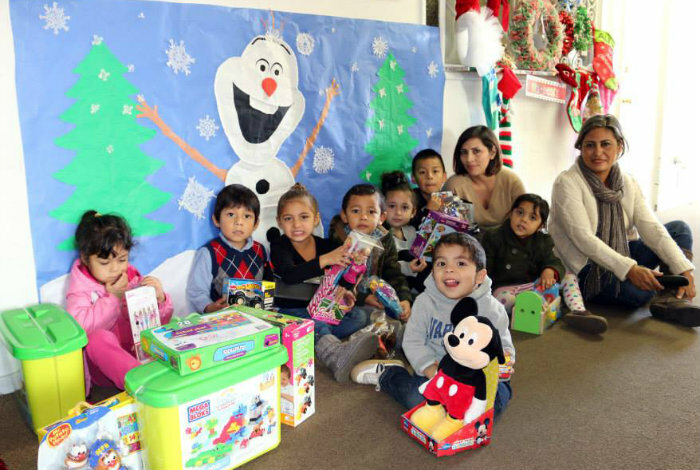 San Marino Rotary Club Brings Christmas to La Casa! The San Marino Rotary Club recently hosted their 8th annual Christmas Party for La Casa’s preschool families. Thanks to a group of talented parent volunteers, led by Mr. Zealy Buggs, our gym was transformed into a Winter Wonderland! The evening was a special celebrate complete with a delicious dinner, photos with Santa as well as a bag full of clothes and gifts for each child. A big Thank You to the San Marino Rotary Club for hosting another amazing party for our La Casa families! La Casa’s Quality Preschool Shines! Our English classes have started up again! Once a week, a group of eager parents spend two hours together practicing and improving their English speaking skills. Our deep thanks goes out to Reverend Margarita Reyes who donates a large amount of her time to lead this class. We also have a new program for the preschool! Mr. Alex Lalin, a La Casa parent, volunteers his time to provide a lively and fun music class for our students. The kids really enjoy moving to the music and singing at the top of their lungs. Thank you Mr. Lalin! December always brings joy to La Casa and thanks to two amazing clubs our students and families are blessed with holiday celebrations. The San Gabriel Taiwanese Lions Club will be hosting their annual Christmas Party for our preschool on December 4th. The students will have their own celebration complete with lively entertainment and a toy distribution. On December 18th, the San Marino Rotary Club will host their annual Christmas dinner for our families, complete with a visit from Old St. Nick! For almost a decade, the club has provided not only our holiday dinner but also warm clothing and toys, and have helped coordinate gift donations from various other organizations to ensure a happy holiday for all. With our deepest appreciation, we salute these two awe-inspiring groups. Happy Holidays! La Casa’s annual awards dinner was held on October 10th at Tamayo Restaurant and Art Gallery. It was a sold out event and everyone enjoyed the beautiful venue, delicious food and lively conversation. This year was very special as we honored Cheryl Prentice for her many years of dedicated service and CEO stewardship. In addition, La Casa co-founder Angelita Lizárraga, who turned 99 this year, was in attendance along with four generations of the Lizárraga family. Dr. David C. Lizárraga presented the Founders’ Award to San Gabriel’s finest first responders, our city police and fire departments. Thank you to all of our dinner sponsors and donors who helped make this one of our most successful and enjoyable dinners yet!